I have posted on Croton on Hudson before. One of the businesses in the downtown area is Senses Salon, located at 5 Old Post Road South, right in the center of town. 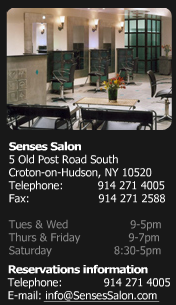 Senses is a full service, unisex salon that caters to the entire family but shines brightest in New York style work without having to pay city prices. Joe Tucci, owner and manager, is board certified a master colorist, international educator, international competitor in men’s hairstyling, and as a makeup artist. His work is impeccable, and he has been written up in Westchester Magazine in both 2004 and 2006. Among the services offered are hair cutting, hair coloring, Japanese straightening, Brazilian keratin treatments, makeup, waxing, and even hair extensions. The staff of 5 is professional, friendly, and highly skilled. There is a private waxing room, a separate room for hairdryers, and the main cutting floor is reminiscent of a high end Manhattan establishment. I don’t know much about Japanese hair straightening, Brazilian keratin treatments, or beauty salons in general. But I do know that people will keep going to a place they like. The striking thing about Senses is cutomer loyalty, and it has kept them in business for 21 years. This one is my favorite success story: one client who relocated to North Carolina flew in just last week solely to get a cut and highlights. She had not found a beauty salon down there that could do highlights as well as Senses.